This topic describes the "Hello World in C" sample application implementation. The following figure shows the sample application. When the NaCl module has loaded, the "Status" field text changes to "Loaded". 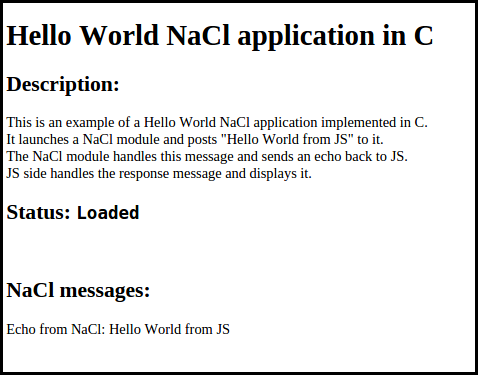 In the "NaCl messages" section, the message "Echo from NaCl: Hello World from JS" appears. For information on how to access the sample application cheat sheet and run the application, see Sample-based Tutorials. * @see <code>PPP_ShutdownModule</code> in ppp.h file. For more information on the above functions, see the "include/ppapi/c/ppp.h" file in your "nacl_sdk/pepper_xx" directory. To compile the NaCl code successfully, the PPP_InitializeModule() and PPP_ShutdownModule() functions must be implemented with these exact names. In the Instance_DidCreate() function, define the actions to perform when the instance is created, such as its initialization logic. The function returns PP_TRUE if the instance creation was successful, or PP_FALSE otherwise. In the Instance_DidDestroy() function, define the actions to perform when the instance is destroyed, such as releasing any acquired instance-specific resources. In the Instance_DidChangeView() function, define the actions to perform when the application viewport is created or changed in any way. In the Instance_DidChangeFocus() function, define the actions to perform when the embedded NaCl module gains or loses focus. For more information on the above functions, see the "include/ppapi/c/ppp_instance.h" file in your "nacl_sdk/pepper_xx" directory. To receive messages, implement the Messaging_HandleMessage() function of the PPP_Messaging interface. Extract the message from the PP_Var object. Concatenate the message to the predefined echo string, using the C standard library snprintf() function. Convert the char buffer to a PP_Var object using the PPB_Var interface. For more information on the HandleMessage() function, see the "include/ppapi/c/ppp_messaging.h" file in your "nacl_sdk/pepper_xx" directory. Connect the interfaces to the NaCl module. For more information on the PPP_GetInterface() function, see the "include/ppapi/c/ppp.h" file in your "nacl_sdk/pepper_xx" directory.